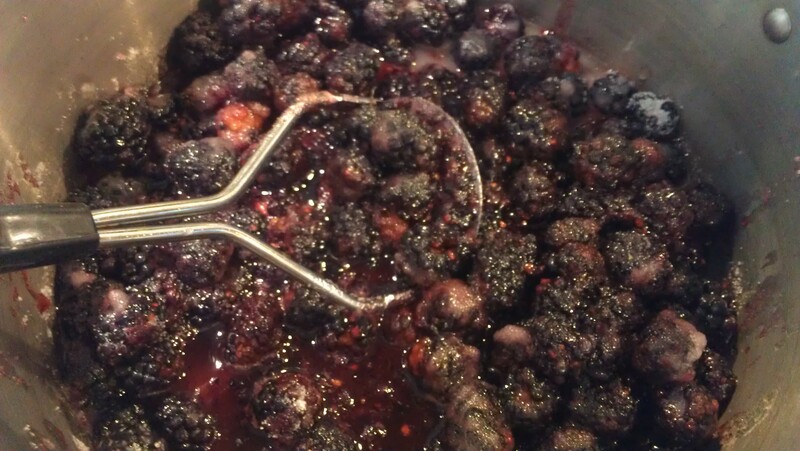 I gave some blackberry jam to a friend and colleague for her birthday last year. She told me her husband paid this jam his best complement. I have not posted the cooked version before but have blogged about the freezer jam version. Now I am sharing this “Damn Fine Jam” recipe with you. Combine all ingredients in a large kettle. Using a potato masher, mash about half the berries as you stir in the sugar and juice. Heat slowly, stirring, and bring to a boil. After it reaches a bowl, stir often and boil for 15-20 minutes. Be careful not to scorch the jam. After 15 minutes, start checking for doneness. I just cook until “jammy.” After it has reached the “jammy” state, skim off any foam if necessary. Carefully pour hot jam into sterilized jars and seal with sterilized lids and bands. Process in a water bath for 10 minutes. Carefully remove jars and let sit undisturbed until jars seal. This recipe yielded seven half-pint jars. Every year about this time, I start wondering how much jam we really need. We kind of horde it throughout the year but we do give LOTS away during the holidays. 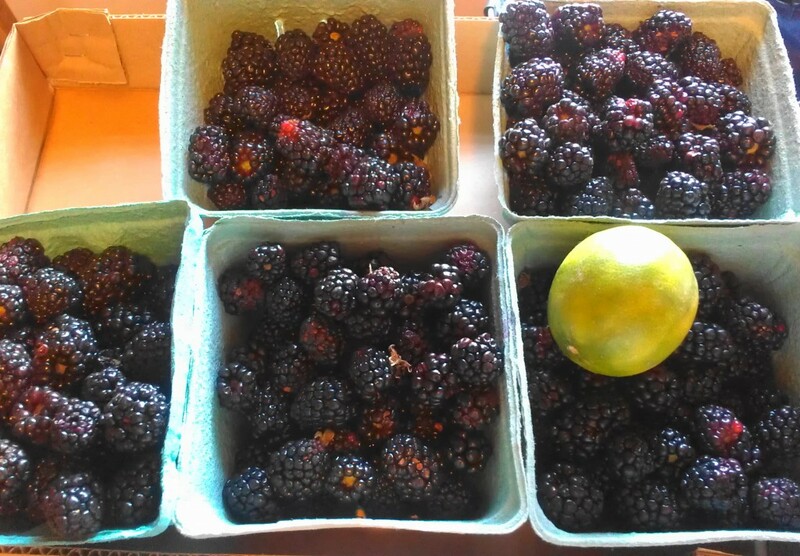 So far, I have made Balsamic-Cinnamon Blueberry Jam, Blueberry Jam with Chocolate Mint, Blackberry Port Jam, and these “damn fine” specimens. Peach season is just around the corner, too. I may seriously need to do a jam giveaway here. Who’s in? 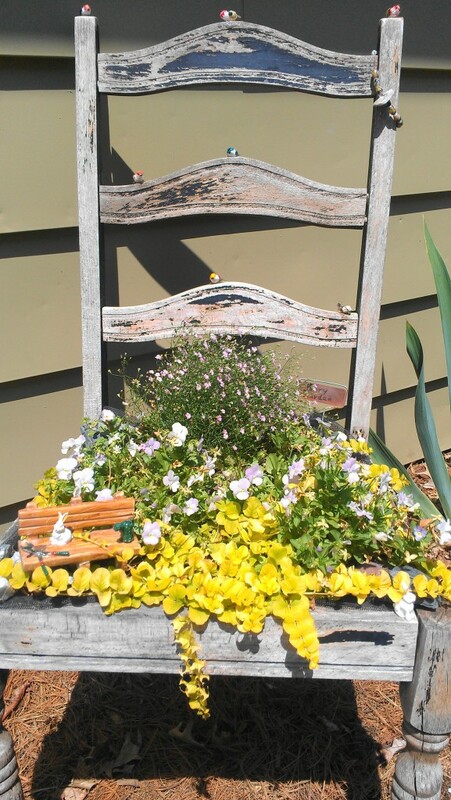 This is mom’s fairy garden. See the bench. And she has little birds perched all around. Abigail, for your virtual flowers for today I went all the way to Iowa. That is where my mom and sister live and they just happened to be on a garden tour (more about that later). I wish I could taste the damn fine jam! I’m just going to have to learn to can! There is really nothing to learn, Jen. Throw fruit and sugar in a big pot, cook the heck out of it, pour in sterilized jars, put on lids, boil it some more in a water bath….voilà ! I’ve never put limes and blackberries together but I”m getting ready to make BB jam so I think I will try a batch with this!! Hope you do. I think I will add some lime zest to my next batch, too. My son just asked me to make blackberry jam and homemade bread. Yours looks fabulous! Still no sight of blackberry over here…if available, hopefully soon, bet it will be expensive. The fresh homemade jam tastes the BEST! What kind of berries are in season now there? Every time I visit your blog I get inspired! When our 6 kids were little I canned everything–It took plenty of food to keep 8 people full. Due to poor health my canning days have almost disappeared. But I’m always intrigued by a batch of jam. 2 people don’t eat like 8 do but jam is so fun to share. Who doesn’t appreciate a fresh jar of homemade jam! Thanks. I truly should do a jam giveaway b/c I do over can jam! Kudos to you though for putting up healthy food for you kids. Busy weekend everywhere. :). Thanks for being a faithful reader. That jam really does look damn fine! I never make jams or jellies, and need to start – this looks superb. Love the touch of lime. Super recipe – thanks. I really love the addition of lime here. I’m going to be making some blueberry jam this week, yum! I’m in for a jam giveaway! 🙂 I love lime in jams! In fact, I prefer lime over lemon in a lot of things. Lime with your gorgeous blackberries sounds wonderful! I may actually do that closer to the holidays. I am thinking about some lime-cherrie jam too. Blackberries are very hard to find here and they cost a fortune! I think the addition of the lime makes all the difference here! I am surprised they can’t be grown there.